Fox’s aggressive bid for Thursday Night Football rights confirms that the NFL is still the top media property – but will it stay that way? Looking across the content landscape, live sports remains the most lucrative – and expensive – content type to own. No other content category can generate the same level or consistency of viewership year after year. Within live sports, the NFL’s status as the ultimate content asset has been validated again and again by eternally-growing rights contracts. Fox’s recent deal to obtain 2018-22 Thursday Night Football (TNF) rights for ~$660M a year is yet another example of the NFL’s attractiveness to content distributors. However, cracks have started to appear in the NFL armor, making Fox’s decision more of a risky bet than a guaranteed golden goose. 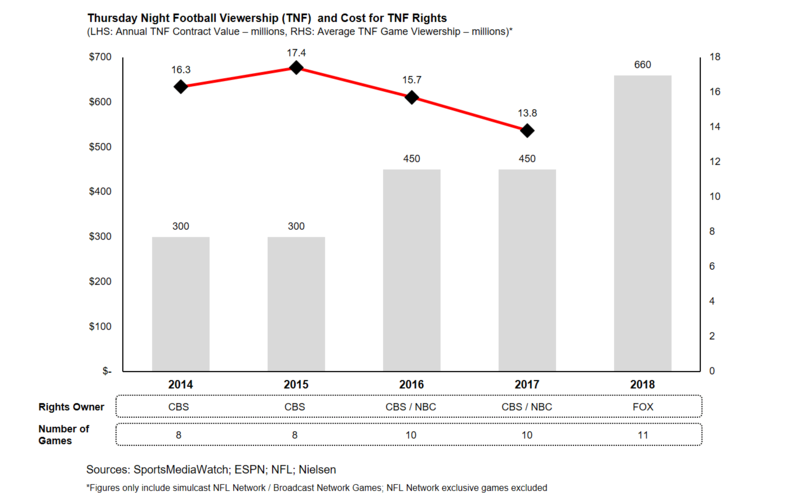 As shown by Figure 1, the 5-year, ~$3.3B deal Fox signed for Thursday Night Football rights represents continued growth in content costs since the initial ~$300M / year CBS paid for the 2014/15 slate of TNF games. From a per-game perspective, the price has nearly doubled from ~$37.5M / game to ~$60M / game – however, this increase in price was not driven by a corresponding increase in viewership, but other factors, such as a hyper-competitive content market, as traditional content distributors like Fox are now being challenged by internet giants such as Amazon and Netflix. 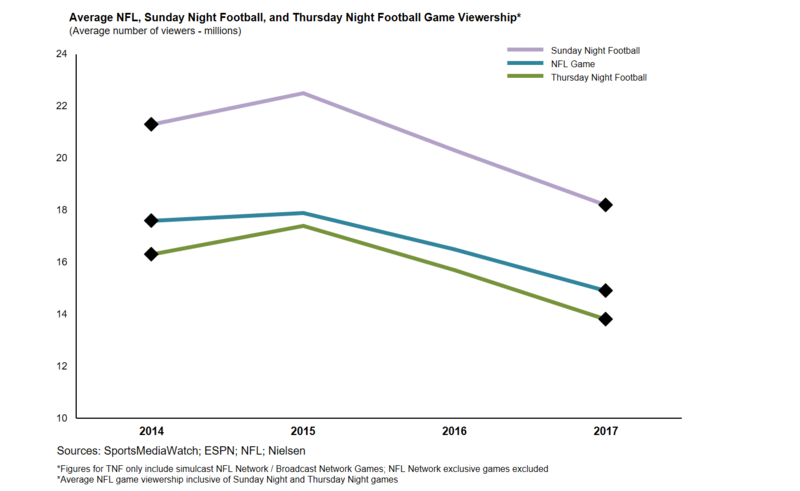 Numbers-wise, TNF viewership is down significantly from its peak in 2015, with consecutive 10% declines in average viewers per game. This is not the first time the NFL has seen viewership stagnate or decline, but the rate of decline and the fact that this decline is seen across all football games is a clear reason to be concerned that Fox might have bought in at the peak. If ratings do not improve, Fox is stuck with an overpriced, 5-year commitment to a declining asset in a time where the future of legacy media companies is still up in the air. While some of the decline in ratings is due to factors such as game matchups, most of the decline is attributable to structural factors that are affecting the NFL and TV more broadly. The decline in viewership is hurting all NFL media assets, even as it remains the top asset in TV – 37 out of the top 50 TV broadcasts in 2017 were NFL games.1 This may be indicative of the state of the broader TV industry as streaming services and cord-cutting continue putting pressure on traditional broadcast networks to keep eyeballs and advertisers. For the major networks, paying up for the NFL at its current prices seems to be a difficult pill to swallow – both NBC and CBS also put in bids for TNF rights, but their bids came in lower than even the $450M they previously paid, which may indicate a bit of desperation on the part of Fox. Football and live sports in general have traditionally been the domain of broadcast and cable networks – even if consumers wanted to stream sports content, they would be limited by local blackouts and be forced to own a cable subscription. Starting in 2016, however, the NFL began selling digital rights to TNF games to digital content platforms – Twitter paid $10M for 10 games in 2016, whereas Amazon won rights to 11 games for $50M in 2017.2 Facebook and YouTube also attempted to get the rights in 2017, highlighting the growing appetite digital content platforms have for live sports content as they build out their respective content libraries. Initial viewership figures from these platforms have not been massive, with Twitter drawing ~265K and Amazon drawing ~310K viewers per game.3 This puts digital platforms at <5% of all TNF viewership, but as streaming continues to grow in popularity, the deep pockets and massive reach of digital players may represent a growing threat to legacy players like Fox. In an environment where every viewer counts, a viewer that watches on a digital platform versus TV is one less viewer that advertisers can reach via TV. 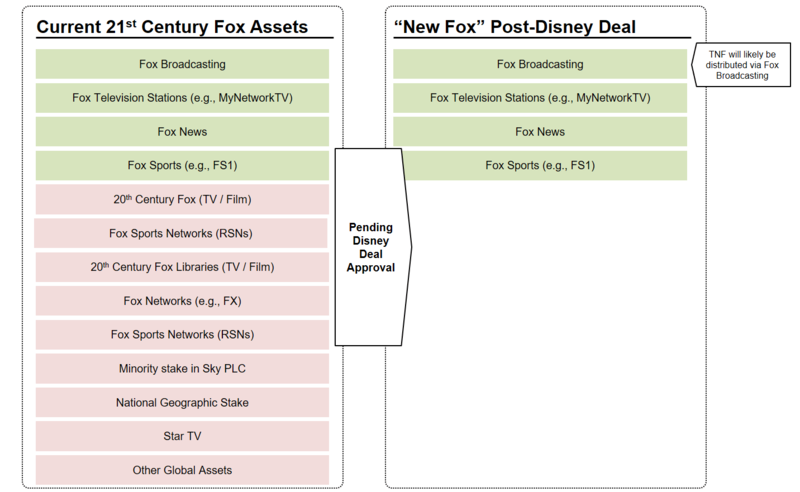 With the pending deal to sell most of Fox’s content assets to Disney, including its 20th Century Fox film and TV studios as well as its regional sports networks (RSNs) (See Figure 3), the remaining Fox assets will likely lean heavily on NFL and other live sports programming (e.g., MLB, MMA) to drive viewership and advertising dollars. After shedding its studio assets, the “New Fox” would be solely focused on the TV industry (minus some radio assets) and is fully exposed to the issues the TV industry faces. Although “New Fox” may make moves to strengthen its position (such as acquiring some assets from Sinclair Broadcasting), “New Fox” will still have to contend with increased competition from Netflix, accelerating cord-cutting and rising content costs. The TNF deal would put even more of “New Fox’s” eggs into the NFL basket, and while such a move may have paid off in the past, the structural dynamics of the TV industry as well as weakness in NFL viewership combine to make the deal a much riskier proposition than Fox would’ve liked. Want to get an insurer’s attention? Just say blockchain.